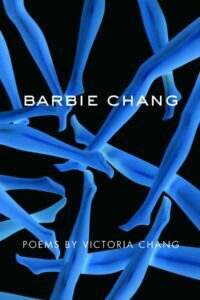 Barbie Chang, the newest publication from award-winning writer Victoria Chang, is an intelligent and absolutely moving collection that uses our connotations of “Barbie” to create a narrative that is surprising, revealing, and ultimately extremely relevant. This book is divided into four sections with each section giving us a new perspective on the life of the persona “Barbie Chang”. The one unchanging element through each section is the innovative use of language both in sound, form, and playful rhythm. By the end of the collection (which I would like to argue can also be considered a memoir in verse) we have grown to understand the many layers of Barbie Chang, through her history, her interactions with loved ones, and the way she moves through the world. Section one is all about the question “what if a name no longer / means what it used / to”. This section tells of Barbie Chang’s familial and inner struggles. By the third poem, Chang is already revealing the new understandings of memory as discovered through the journey of having a father who is learning to navigate life with dementia. Readers also learn that Chang’s mother has pulmonary fibrosis. These poems build our understanding of what lingers in Barbie Chang’s mind as she moves through raising children, being in love, and dealing with social politics. We’re introduced to these thoughts in ways that feel very human, and contrast the images that feel so familiar to the persona of Barbie. When Barbie Chang ponders the life her mother leads she “runs on a treadmill / pinches her nose to see // what her mother’s breathing feels like”. This swift transition from a woman on a treadmill to the almost childlike innocence of pinching her own nose is undeniably intelligent and affective. We connect strongly with her desire to understand her mother’s life. In both Section two and Section four we develop a new understanding of the situations Barbie Chang encounters in her daily life outside of the personal familial moments. We see her as a mother, as a woman trying to navigate social circles, and as a woman moving through a harsh political climate. The longer poem of this book in the second section expresses many of these fears and concerns in advice being passed on to the character “P”. With a new understanding of these fears, worries, and words of advice, we return to many of the situations touched on in the first section with a new realization of Barbie Chang’s inner strength. This third section is where we see her passion and desire “to be someone / special to no longer // have wet hair to no longer be spectral / to be a spectacle”. By the end of this collection readers feel they have witnessed the metamorphosis of someone who has taken difficult-to-navigate situations and used them as means to accept that “there is peace in darkness”. We close the book feeling a close kinship with Barbie Chang and, in recalling each individual poem, we realize language and poetry can consistently challenge our expectations. Valorie K. Ruiz is a Xicana writer fascinated by language and the magic it evokes. She is an MFA Candidate at San Diego State University where she works with Poetry International. Outside of her poetic work, she enjoys exploring digital literature and can be found working on her Twine game (Brujerías) or making galaxy gato themed websites in her spare time.